“For Greater Glory” – A look at a movie about Christianity in the face of violence | J.W. Wartick -"Always Have a Reason"
“For Greater Glory“ tells the story of the Mexican Government’s persecution of the Roman Catholic Church following its anti-catholic laws written in 1917. 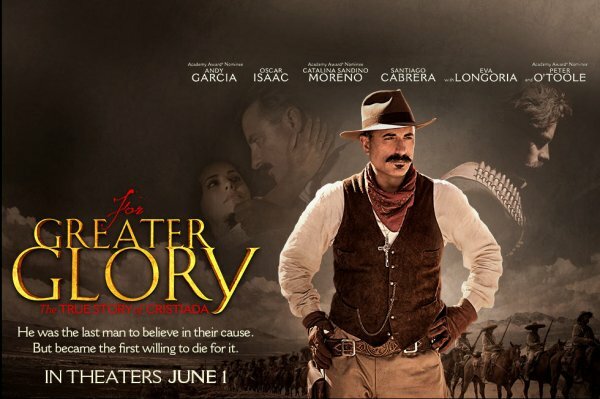 It follows the lives of various Cristeros, those Mexicans who revolted against the government in the name of religious liberty. The movie goes beyond being just another Western movie to exploring some extremely important sociological and religious themes. I won’t summarize the plot (you can find that here), but there will still be SPOILERS below. The general Enrique Gorostieta Velarde is clearly a “good guy.” He was, himself, no Christian and certainly not a Roman Catholic, but he stood up against those who would persecute people simply for their beliefs. He also did not stand for compromise: he wanted toleration to be granted to Roman Catholics. He fought for an ideal. Even if that ideal was not one of the faith he was fighting to defend, he felt that there was injustice, and fought against it. It is unclear whether the historical Enrique Gorostieta Velarde ever became a Christian. In the film, it certainly make it seem as though in making his arguments, he came into a kind of faith in God. It also seems to be the case that the historical general had some political ambitions in that he desired to bring about a change in the Constitution to provide for more toleration. Father Christopher is an example for Christians everywhere. He does not back down in the face of violence. He became a martyr by standing in front of men who were doing him violence and proclaiming Christ to them. His martyrdom served as inspiration for a number of people in the film. The anti-catholics in the film are clearly the “bad guys.” It is hard to argue with this. Anyone who chooses to attack and kill people simply because of their beliefs certainly qualifies for the catchall “bad guy” terminology. Plutarco Elías Calles, the Mexican President, an atheist, decides that he must use a violent crackdown to keep the Roman Catholic Church from becoming involved in Mexico. He couches his oppression of the Roman Catholics in language of secularism. Instead of focusing upon their religion, he makes his argument based upon the rule of government: the Roman Catholics serve a ruler (the Pope) who is outside of this country, and so they are a danger to the stability of this country. Despite this “secular” language, the fact of the matter is that throughout the film, the government is viscous not just towards the Roman Catholics as people who serve a different master, but also simply as religious persons. Crosses are burned and churches are destroyed. People are slaughtered during worship. It is a wholesale war against Christianity. The film does not draw a hard and fast line between “good” and “bad,” however. There are also the ugly: those who, with good intentions, also commit atrocities. The Cristeros (those who fought for religious tolerance of Roman Catholicism) who commit atrocities were the “ugly.” Some felt they had to fight evil with evil, and committed horrible acts in the name of their cause. This is exactly what Christians are called to avoid. The movie brought up the constant debate within Christianity between just war theorists and pacifists. It was surprising how lucidly it presented the issues. There were those in the film who refuse to use violence to fight against the government, citing Christ’s example of turning the other cheek. Yet even they become involved in getting supplies such as bullets to the Cristeros. On the other hand, there are those who argue for a just war tradition: when injustice is running rampant, should not Christians be among those who stand up against it, even if that calls for using force? The film never answers one way or another; instead, it leaves it to those watching to weigh the merits of just war and pacifism. I tend to favor the just war theory myself. It seems to me that if a government like the Nazi Regime exists, then it is perfectly justifiable to use force to prevent them from perpetuating their evils. Historically, according to more than one source I looked up, it is argued that the Cristeros actually had little impact on the overall outcome of the changes and toleration which came to Mexico. Instead, it was a deal negotiated by the Vatican with the Mexican government. Yet it seems for me historically perplexing as to why, exactly, the Mexican government would have desired a compromise if the Cristeros were not in operation. I speak here as no expert on the topic by any means. I’d be interested in reading your own thoughts. It is hard to see this movie without thinking about the elephant in the room: atheists are in power, and religious people are killed. It’s a theme in the movie, but it also plays out time and again throughout human history: the French Revolution, the Soviet Union, the massacres of Armenians in Turkey, the Spanish Civil War, and more. Why is it that it seems, historically, every time a secularist government has taken power, the religious persons are the ones who suffer violence? The answer to this vexing question seems to me to be quite clear: the notion that religion is violent and secularism stops violence is just false. Not only that, but the distinction between secular and religious is, itself, a mere construct with no ontological reality. I have argued this before when I discuss the Myth of Religion. “For Greater Glory” is a movie that should be a must-see for those interested in worldview discussions. I could see it being used at an interfaith group, church youth group, or seeker group to generate discussion. The movie is definitely violent, and it shows the good, the bad, and the ugly unapologetically. It is for that reason that it must be seen. What is perhaps the most shocking part of this movie is the fact that, prior to watching it, I had never heard or even imagined that Mexico had persecuted Christians. The violence committed against Christians by others in authority continues into the modern era, and it is truly depressing to know how little we hear about it. I can’t help sometimes but join with David and say “How long, Oh LORD?” (Psalm 13). I discuss the way that construct of “religion” has been used to denigrate an alleged “religious other” in my post: The Myth of Religion. I have looked at a number of other popular movies. Check them out (scroll down to see more posts) in my movies category. An interesting discussion of Christian pacifism can be found over at Glenn Andrew Peoples’ blog: Pacifism, Matthew 5, and ‘Turning the other cheek’. Make one wonder what other stories like this are out there wanting to be told.